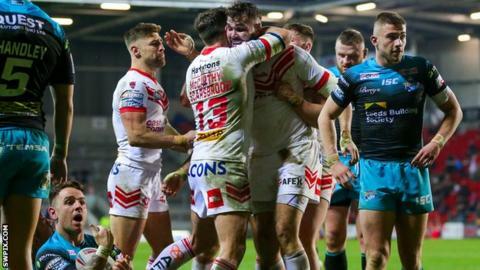 St Helens scored 17 unanswered second-half points against Leeds to secure a third straight victory to start the new Super League season. They dominated early on and raced ahead, only for a Rhinos try to spark a 22-point burst for the visitors. Saints gathered themselves at half-time and seized back control through two quick-fire Alex Walmsley tries which set them on their way to victory. Leeds have now lost three out of four games under new boss Dave Furner. Both sides were disrupted early in this see-saw contest as Saints' Kevin Naiqama left the field with a head knock after 90 seconds and was not fit to return, while Leeds lost Stevie Ward to a knee injury only a few minutes later. But it was the home team that adjusted better, deservedly crossing through Theo Fages and Jonny Lomax to earn an healthy lead. With the Rhinos under pressure, captain Kallum Watkins came up with a timely score to wrestle back some momentum and it caused a shift in the match. Konrad Hurrell, Ash Handley and Mikolaj Oledzki all went over before the break to stun Saints and give Leeds a 22-10 half-time advantage. But triggered by two bustling efforts from Walmsley, St Helens performed a momentum shift of their own. After the big England prop's two tries, Luke Thompson's jinking run took Justin Holbrook's side back ahead and despite a late Leeds rally they held out for a deserved win. St Helens: Coote; Makinson, Naiqama, Percival, Grace; Lomax, Fages; Walmsley, Roby, Thompson, Peyroux, Taia, Knowles. Leeds: Walker; Briscoe, Watkins, Hurrell, Handley; Lolohea, Myler; Peteru, Dwyer, Merrin, Ferres, Sutcliffe, Ward. Replacements: Cuthbertson, Singleton, Oledzki, Smith.